Maille is a Single Feature Mod that makes chain mail craftable and re-textures the items and armor model to look a bit nicer. By default, chain mail takes 89% of the materials of iron armor. Maille also re-textures the chain mail items and model to look...better. •Whether or not to use iron ingots for the boots. Haha, wow. That's a riot. To make a full set from what I'm seeing is you'd need 22 iron ingots removing the iron ingots from the boots and pretending they are maille, which will create 198 Iron Nuggets That's 2 less than what's required for the 2 less ingots than what's required for the, if you just get 24 iron ingots you can make a full set of iron armor making this a terrible mod. remove the chain part just have the nuggets themselves turn into maille. And this will become the penacle of mods. I don't think Chain Mail taking up 89% of iron compared to Iron Armor makes it worth all of this crafting and work. I mean, why not just make normal Iron Armor when it has more defense and durability than Chain Mail and requires less work? I suggest that the amount of links produced from Iron Nuggets should be 6. This would make Chain Mail require less iron to craft, and it would be more practical to use during the early game. A chain mail set has 80% the defense points (24 vs 30), the same durability, and 133% the enchantability (12 vs 9) of an iron armor set. 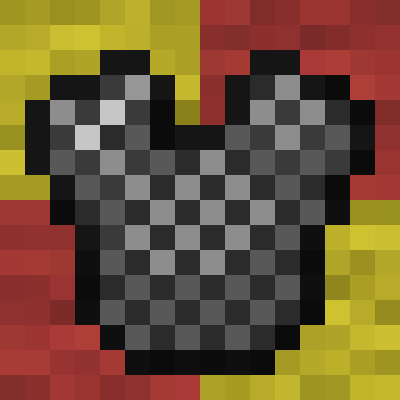 The proposed 4 iron nuggets -> 6 chain links recipe would result in a chain mail set costing 35% of an iron armor set. The output of chain links from iron nuggets can be modified in the config or recipe file (Maille1.12.2-2.0.jar\assets\maille\recipes\chainlinks.json) depending on the mod version. Technically, the ultimate goal is to require heating metal to smith. in which case, the obvious use for chain mail would be that it will not require any heating to create. Using this in my modpack. I love this mod!!! im assuming i can use this in a modpack, correct? What happened? Did the modpack get rejected? I'm just wondering because I'm planning on making one. some weirdness happened with the mod files / adding server files. i have made some modpacks since but that particular modpack was never uploaded. Hey fyi based off of the image in the description the default resources required don't seem to take only 63% of the resources of iron armor. It looks closer to 89% of the resource for iron armor. 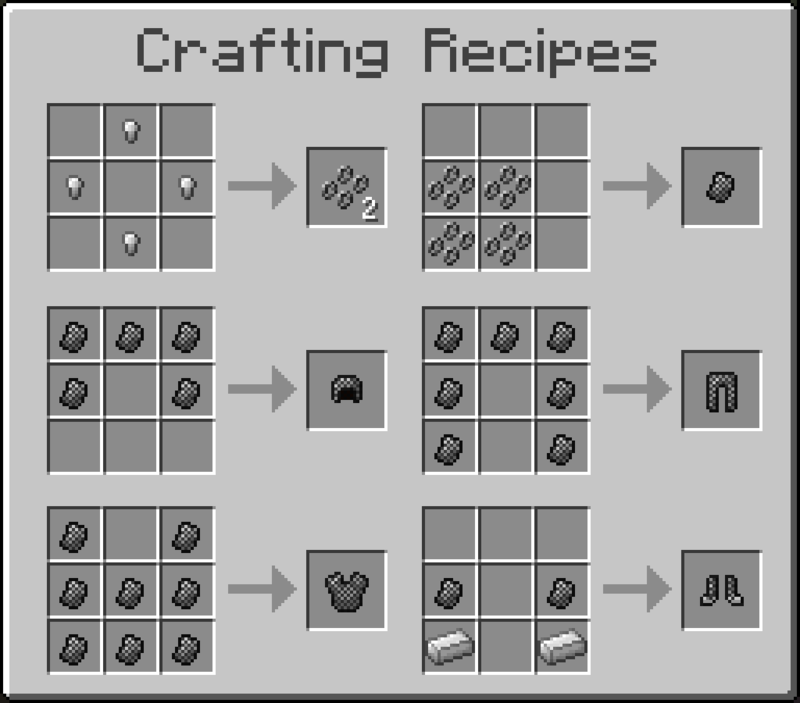 Historically, of course, the iron ingots in the boots recipe would be leather. Possibly that's an idea that would tie in nicely with Leather Works. Its nice that we're able to craft chainmail instead of only being able to trade it off of villagers, + i love the new textures. Perhaps you could also find a way to implement the studded armor that is a removed feature from the early days of minecraft? does this mod adds it by itself?